100% Naturally Alkaline Spring Water + pH of 8.1: Essential minerals and electrolytes for supercharged hydration. 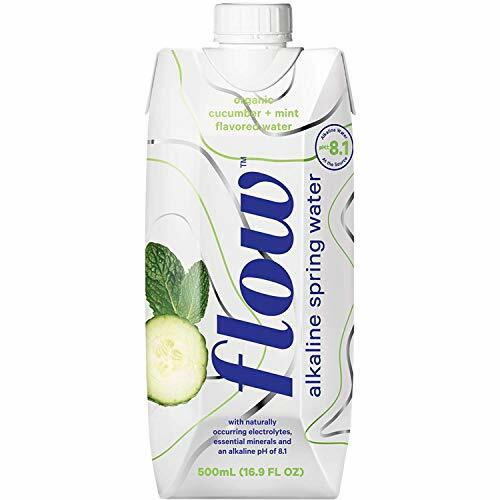 Healthy Minerals: Flow Alkaline Spring Water contains natural, essential minerals like cal-cium, potassium, magnesium and bicarbonate that gives Flow Alkaline Spring Water its fresh, smooth taste. Organic Cucumber + Mint: This water is designed for drinkability with the organic essence of cucumber and mint. No sugar, no juice, no calories, no preservatives, no GMOs. Eco-Friendly Pack: Designed with +68% renewable materials + 100% recyclable and a plant-based cap for low carbon footprint. Straight From the Source: Our naturally alkaline spring water, with a pH of 8.1, comes from our family-owned artesian spring.